When I mention ‘Bobbi Brown’ what pops into your head? The classic Shimmer Brick, or those beautiful neutral eye shades that we all know and love? I bet you it isn’t skincare. But this all changed recently when I was invited into the store for a skincare consultation, and within a few minutes of sitting on the makeup artist’s chair, I’d fallen in love with the skincare. The oil felt so gentle and luxurious on my skin, the moisturisers seemed to skin in within moments, and the smell? Unlike any skincare that I’ve ever used before. Let’s start with the Soothing Cleansing Oil. As a somewhat lazy cleanser, preferring to just wipe away the day’s makeup with a Micellar water, it takes something seriously special for me to actually bother with water – but the texture, fragrance, and overall luxury experience of using the Bobbi Brown Soothing Oil means that I actually get excited about taking the day’s makeup off. I use one or two pumps to remove my makeup, massaging into dry skin before emulsifying with water. I remove with a warm, wet flannel before moving onto the toner. 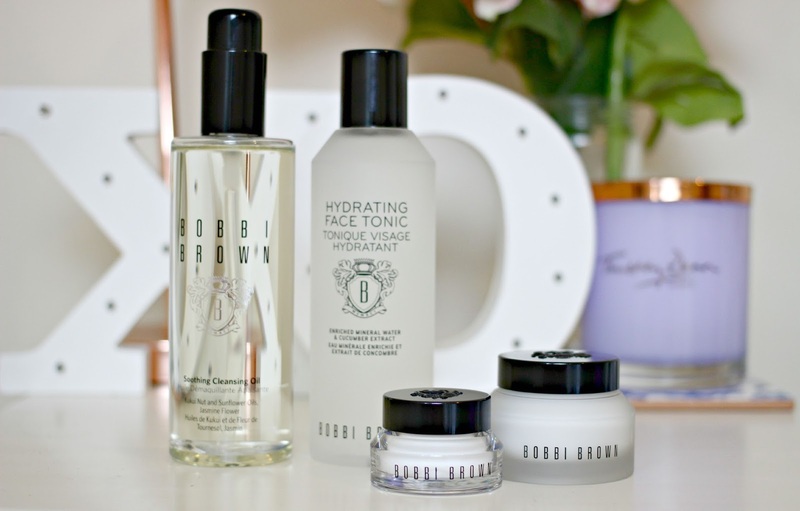 While many toners leave my skin feeling dry, Bobbi Brown’s Hydrating Face Tonic does exactly what is says on the tin, and leaves my skin feeling soft and soothed after application. In the evening my skin is left feeling totally clean, and when I use in the morning my skin is in the perfect condition for applying my next products. My eyes (or the bags underneath…) need serious attention, but with too little time and too much to do I can’t be waiting around for a luxurious eye cream to sink in, so Bobbi Brown’s Extra Eye Repair cream is like a saviour in a pot. It sinks in by the the time I’ve made my morning cup of Green Tea, so I’m ready to apply makeup just moments later. With combination skin, the Bobbi Brown Hydrating Face Cream feels like it was designed with me in mind. It’s a lightweight formula but also provides by skin with the hydration that it needs, as well as nourishing and conditioning areas that need a little attention. It’s pricey, yes, but I use about half the amount that I’d normally scoop out of my previous moisturiser, meaning that this little pot should be hanging around for quite some time! Have you discovered Bobbi Brown skincare yet?